Hello, Gorgeous! : WRISTOLOGY Watch GIVEAWAY!! But, my parents were right. Not every watch is worth it. It has to be something that's unique AND versatile. Well, you know who has fabulous watches that go above and beyond? Wristology Watches! And guess what our giveaway today is? A gorgeous watch from Wristology!!! You've seen me wearing their Alex Tortoise watch in some of my outfit posts lately. 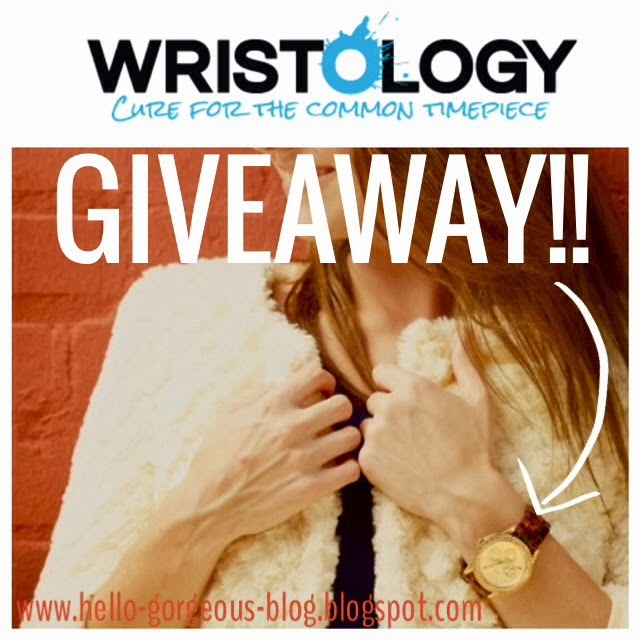 Now you have the chance to win your own choice of a watch from Wristology by entering below! And thank you Wristology Watches for the amazing giveaway!! The small print: Giveaway ends on Sunday October 13th and is open to U.S. residents only. Winner must claim prize within 48 hours. If prize is left unclaimed within this time, a new winner will be chosen. Love you blog. Copy catted you on the printed Target skirt you posted this week! A cozy sweater would be perfect for this watch! I'd style this watch with jeans, a button up, and cardigan! Super gorgeous watch! I would wear this watch with a sort of "preppy" outfit. Dark wash jeans with some brown boots, a pink button down and a blue sweater on top! It would be adorable! I love this with a chambray shirt! I'd style the watch with my skinny jeans,boyfriend sweater, and my new brown ankle boots! I would wear it with mustard jeans, navy sweater and riding boots! It would look fabulous with ANYTHING! Would wear this watch with button down, sweater, jeans and boots! I would wear it with my camel tweed pants, chocolate brown cashmere sweater and pile on the gold accessories to add luxe. Finish it off with a great pair of oxford booties. I love your look and all the watches. Would be one happy lady to win this watch! Thanks for the opportunity. I am always on the search for a great watch!! Tunic dress, leggings and boots with the awesome watch. I love watches! This one would be perfect with anything leopard print! I would definitely wear this to school with my leopard print dress, jean jacket, and brown boots. This would make transitions even better if I got to look down at my wrist during playground time and saw it was 10:30 and time to ring the bell and go inside. A watch is the perfect accessory! i have been craving a new watch, but on a student budget, haven't been able to afford one i really want... i want a gold watch that i can dress up for weekend evenings out or on campus with jeans, a long sleeved t-shirt and a puffy vest. Is there anything that wouldn't go great with this watch??? I think not. I'd style it with a chambray shirt, olive skinny jeans and a scarf. Thanks for the chance to win! A cozy sweater and jeans! LOVE it! Thanks for the giveaway! I would style it with a chunky sweater and jeans! I LOVE watches too! Sometimes that is all you need to make a fashion statement with he right outfit! Thanks for this opportunity!! Thank you for the awesome giveaway! I am in dire need of a nice watch that goes with everything! I also love watches! I'm a fan of wearing big oversized men's watches. I think they look so powerful on my small wrists. It's been FOREVER since I've worn a watch but this one I LOVE! I'd wear it on the daily - I'm a watch girl through and through! Love this watch! I think it would be great with an oversided cable sweather and some boyfriend jeans! What a beautiful watch! I would love to win! That watch is so cute...would wear it with any of my fall layering (sweaters, jean jacket, plaid, etc.)! 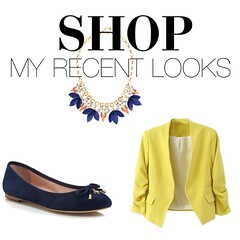 With a gorgeous leopard print scarf, blazer and skinny jeans! Beautiful watch. It would go great with all the fall colors of the season. I would pair it with a coordinating bangle. Love your style and get a lot of tips from you. Love that you put things together at great prices. Love love love your posts! Good luck everyone! i'd wear that watch all fall! Love watches - especially these! Jeans, heels and a cute blouse! I love this watch. I don't own any watches currently and this would be a nice first! brown riding boots, silk blouse with a bow tie neck and a tweed sweater... feminine and soft! Jeans, boots, blazer with a long necklace and a cute shirt! Love these watches! I would layer a gold watch with bangles and bracelets and wear it with everything! I've been wanting a gold watch for work and play!! I would stack it with my arm party favorites! Thanks for the giveaway, Yasi! I have a beautiful silver Michael Kors watch that I wear with everything, but now I have a lot of gold jewelry with no watch to match. So I know that I would wear it with my beautiful gold chain necklace and little black dress, among many, many other outfits. I would style it with skinny jeans, boots and a cream sweater. Just in time for Fall! Styling would be a BREEZE! I'm obsessed with tortoise this season! I would pair it would my skinny jeans, big chunky sweater, and floppy felt hat. I would wear this with a dress I received for my birthday ! I will be 26 on October 22! Learning to Layer: 5 Easy Steps.